Matsutake1 are the best when stir-fried with white button mushrooms. It is also excellent stir-fried hot with autumn sauce on its own. Unfortunately they cannot be kept long. They work well in dishes, providing them a delicate umami. 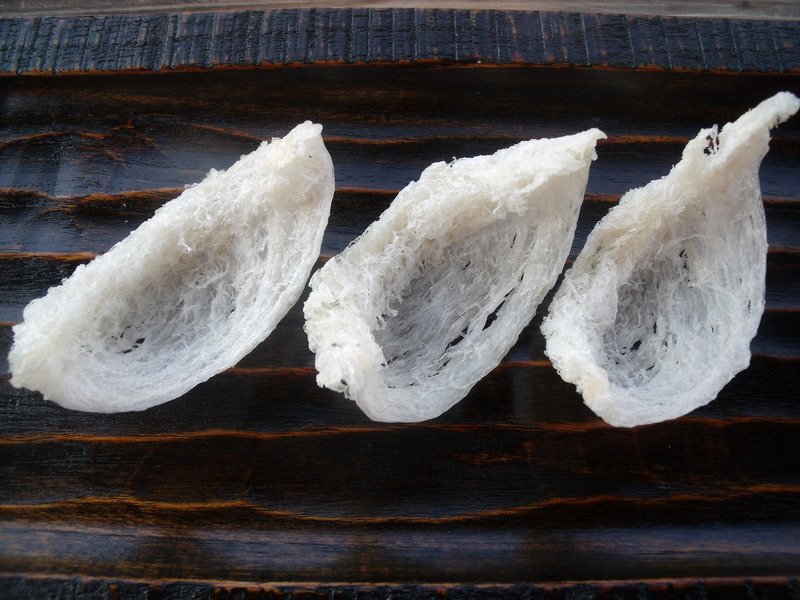 Due to how tender they are, matsutake can also be added to line the bottom of the bowl of birds nest. I am rather fond of the soft, crisp textures of bean sprouts. When stir-fried, they must be cooked until completely done in order for the flavours from the seasonings to combine harmoniously with them. 1I cannot find anything on Chao and Yu and their exact relation to the two early Emperors, Yao and Shun. But from this example, they are probably from a lowly or a commoner background. P.S. Been a bit negligent in posting over the last while. Been trying to catch up with everything in life since the sprint to the finish live with the book launch. Will be doing something thinking about how to post the rest of the Suiyuan Shidan translations, either in bulk or section by section as I have been doing. In any case, some exciting stuff will be coming to this blog. Stay tuned! Bird’s Nest is an a precious ingredient and should not be used trivially. If one wishes to serve bird’s nest, each bowl must contain at least 2 liang  of the ingredient, prepared by first soaking it in boiled rain-water and any dark strands or debris removed with a needle. It must then be boiled in stock made by combining the broths made from tender chickens, good ham, and new mushrooms until the bird’s nest takes-on the tone and clarity of jade. Note that bird’s nest is extremely delicate  in flavour and must not be prepared with anything oily. Its soft and elegant texture also necessitates that is never combined with foods that are firm or aggressive in taste. People today like to serve bird’s nest with shredded pork and chicken. In doing this they are only tasting shredded chicken and pork, not bird’s nest. In a futile effort to feint wealth, some host would scatter 3 qian  of raw birds nest as a thin facade on top of a bowl of soup. One could have picked them out like wisps of grey hair. These shreds of birds’ nest immediately disappear when a guest stirs their bowl, revealing it full of only base ingredients. Like the ruse of a beggar child pretending to be rich, they only reveal how poor they actually were. If for whatever reason one must add anything else to the bird’s nest soup, use shredded mushrooms , shredded bamboo shoot tips, fish maw, or slices of pheasant breast. During my visit to Yangmingfu, Guandong I had an incredibly good winter melon and birds’s nest soup. It was richly flavoured with only chicken and mushroom extracts, with the soft textures and delicate flavours of the two main ingredients matching each other superbly. Bird’s nest should always jade coloured and translucent, but never opaque white. Those who make bird’s nest into balls and pound it into powder are doing nothing but forced and exaggerated interpretations of the ingredient. : I had been struggling with how to translate 清 (qing). In the past I used “light”, “clear”, and “mild”, or a combination of them but none have felt completely correct. However I think I now have found a satisfactory English translation for this; one that gives the essence of this culinary term both the right meaning and feel: “delicate”. A few years ago, I had a clear cucumber soup that exemplified qing. The broth was clear, devoid of fat and not overburdened by umami. The mature cucumber gave the soup a slightly sour edge. The delicate elegance of the soup somehow calmed the clamor of the restaurant despite one being perfectly aware of it, like a petal floating in a rippleless puddle. Similar to how great French chefs of past elevated the lowly Coq-au-Vin, the chef that crafted this soup managed to take a rather unremarkable, homely peasant dish and transform it into a transcendental work of art. Drinking it was possibly as close as one could get to imbibing a physical bowl of Zen. : At first I thought 蘑菇 (mogu), a loose term translating to “mushroom”, would mean shitake, but that does not make sense since the dark skin of shitake would clash with the birds nest. Sure enough Yuan Mei referred to shitake as 香蕈 (xiangxun) in other parts of the manual. This leaves one thinking what mushroom he was talking about here. My guess is a common white colour mushroom such as Coprinus comatus (Shaggy mane young/known as chicken drumstick mushroom) or Pleurotus eryngii (a thick fleshed oyster mushroom/”king oyster”杏鮑菇). Note, I may be wrong. : If your culinary experiment over-strech the “capabilities” of your ingrediants, don’t try to serve to your guests. Each ingredient has its own innate characteristics, which are best shown off using a specific set of culinary techniques. One must not be “force” an ingredient using techniques that exaggerate or overextend these characteristics. Bird’s nest is delectable the way it is, so why would one wish to pound and shape it into balls? Sea cucumbers are fine in their original forms, so why would one wish to turn it into a sauce? One knows that sliced watermelon quickly loses its delicate freshness if left out too long, yet some would go so far as to process it into cakes and pastries. Similarly, overripe apples lose their crispness, yet there are those who would steam and dry them. : There must be a better term than “exaggeration” or “over-extension” here. The idea is that an ingredient should not be “coerced” into dishes or forms that do not suit it’s nature. The analogy in people is like dressing a prudish accountant up like a rapper with sagging pants; it’s so out-of-place that it’s painful to look at. Suggestions welcome. : Watch the (original) Iron Chef episode on Bird’s Nest where Chen Kenichi battles Li Junlun. Some of the bird’s nest dishes looked pretty good, but most of them makes you go WTF. : Qiuteng Bing translates to something like “Wisteria biscuits” while Yulan Gao to “Magnolia cake”. Airs of pretense surround the names of these little pastries. Yuan Mei mocked the authors of these imaginative creations at the end of the Preface, calling them “mediocre scholars”. Oh Snap! : In Chinese folk tales, in order to attain sainthood, a person has to climb to the peak of a mystical mountain to apprentice themselves to a long white bearded saint, being tested in trials and undergoing years of physical and psychological struggle. Become a saint in the comfort of one’s home is infinitely tamer and less extraordinary. I think what Yuan Mei was trying to indicate here that one should not be ashamed of cooking an ingredient in the canonical way, because the technique is simple or common. If the cooking technique does wonders to the ingredient, who cares whether it’s simple or common? Making a great steak is simple, requiring only 2 ingredients (good beef and salt, 3 if you add pepper/spices) and a hot grill. Pretension, bad technique, trying to do something out of the ordinary too often destroys the dish. Case in point, there is a place on Peel street in Montreal called “Entrecôte St Jean” which grills their steak salt-less and then covers it in a greasy mustard sauce before serving. For a restaurant that does ONLY steak, it is remarkably meh. I attribute their success largely to the nice French Bistro décor and the tasteless clientele that frequents the place (4 stars on yelp? What?). The term “庸德庸行” probably comes from Zhongyong (中庸: Scroll 13). When preparing a dish, a vulgar cook will typically have a simmering pot of lard readied to douse on the finished dish before serving, just to impart some richness to it. Even something as light and delicate as bird’s-nest would not be spared this polluting offense. Then there are those vulgar ignorant people, with their long greedy tongues and teeth, who would gladly gulp down these dishes doused with liquid grease. Perhaps they were reincarnated from a bunch of hungry ghosts. : I’m not sure if this is always bad. For example, when a fish has been steamed to perfection and garnished with shredded green onions, it’s quite nice to top it with a bit of sizzling hot sesame oil mixed with cooking oil to finish it. No doubt, Yuan Mei would consider such an act (and proponents of it) vulgar.